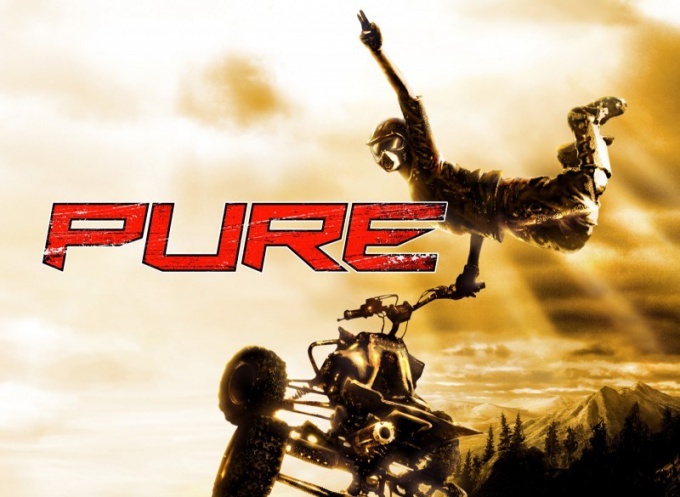 Pure – a curious instance of the game in the genre of extreme racing. These games come out infrequently, and are published by large companies and even rarer. The final product turned out far from perfect (unclear stunt system - confirmation), however, a certain level of quality it still stands, and play it still nice. Check control configuration. If you play with gamepad, you will use four keys in the right part of the device and the right analog stick, which is generally very convenient. When playing the keyboard layout is the default "1" - "4" and arrows. Both management options can be modified for yourself, if for some reason you are not satisfied. The stunts performed only in flight. The more time you spend in the air, the more tricks you can do in one combo, so your goal is to maximize the height and duration of jump. For this to springboard type acceleration with nitrogen, then hold for two to three seconds jump key (default "space") and, at the time of separation from the ground, release the key. Tumbling is divided into four levels of difficulty. The beginning of the race you available only the most basic elements, activated by pressing the key "1". With their help, you need to fill out the scale of "Adrenaline" to a certain value, this will allow you to perform stunts in the following way. Please note that for quality combination you will get more nitrogen and, therefore, can achieve greater acceleration. To run directly the element of the press with a level of difficulty and any of the arrow buttons. Thus, for each key there are four stunt (number of directions). Please note that if you release the key before the item ends, it will be interrupted. However, it is much better to interrupt a combo, than fail to land and lose the lead. In Freestyle mode, try to make combo a greater amount of diversity. For example, if you have reached the maximum scale value "adrenaline", then do the two elements of the fourth level is not necessary. Far more productive would be a combo consisting of "4"-"1"-"1"-"1". Similarly, for other levels – the number of tricks often prevails over quality.